1.This unit is for cleaning castings and instruments, removal of grease, sticky wax, pickling agents, contaminants and adhesives. 2.Users can use tap water instead of distilled water which reduces production costs. 3.The boiler, casing, buttons, indicator lights, and internal parts are made of stainless steel which significantly increases its lifespan and reliability. 4.This unit has both steam-gun-controlled and button-controlled steaming methods, it features low water, over-pressure, over-heat protection and forced heat function. 5.It also has high heating power, quick steam generating power, high efficiency, strong and stable cleaning power. ♥✉If you have any question about the products, please feel free to contact us before leaving the feedback, we will deal with the issue immediately and carefully until you are satisfied. This unit is for cleaning castings and instruments, removal of grease, sticky wax, pickling agents, contaminants and adhesives. Can use tap water instead of distilled water which reduces production costs. The boiler, casing, buttons, indicator lights, and internal parts are made of stainless steel which significantly increases its lifespan and reliability. 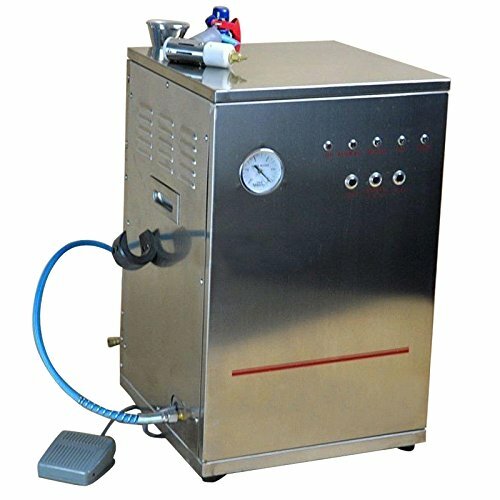 Has both steam-gun-controlled and button-controlled steaming methods, it features low water, over-pressure, over-heat protection and forced heat function. Has high heating power, quick steam generating power, high efficiency, strong and stable cleaning power. If you have any questions about this product by Angelwill, contact us by completing and submitting the form below. If you are looking for a specif part number, please include it with your message.